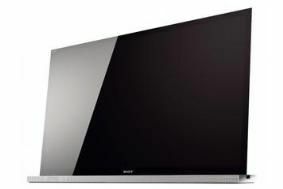 Sony expands Bravia 3D TV range with two new network models | What Hi-Fi? All three feature Bravia Internet Video for streaming on-demand and online content such as YouTube and LoveFilm, as well as accessing Twitter, Facebook and Flickr. They're 3D-ready too, so can be upgraded by adding a 3D Sync Transmitter and Sony Active Shutter 3D glasses. There's Dynamic Edge LED backlighting on all three sets, plus MotionFlow 100Hz Pro on the 'NX713 and MotionFlow 200Hz Pro on the 'NX813. A 2.1 sound system is mounted in the base. Sony's 'monolithic design' means the screen is super-slim, and the optional stand allows the TV to be tilted back at an angle of six degrees. “With 3D capability, the connectivity of Bravia Internet Video and stunning monolithic design, the NX713 and NX813 are perfect for people who want both style and performance from their TV,” says Christian Brown, senior category marketing manager, Sony UK.